Do you find it easy or difficult to learn a foreign language? How do you learn best? While I may not have mastered all the foreign languages I have studied over the years, I do consider myself an expert at being a student of languages. 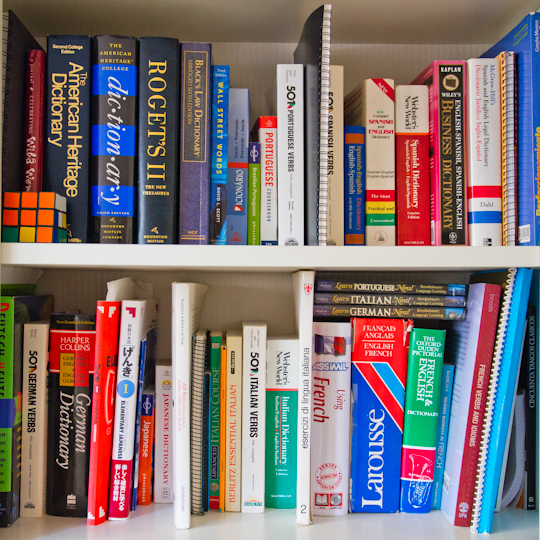 Yes, all of the books in the photo above do belong to me: English dictionaries, law dictionaries (arguably in English but that is debatable), French, Spanish, Portuguese, Italian, Arabic, Japanese, German…. Don’t worry, there are also a few more at the office. And with a few exceptions, I have opened all of those books (albeit virtually none of them recently), even if most of what I once learned I’ve since forgotten. I have tried it all at one point or another – conversational language classes, lecture halls, group classes, private lessons, language exchanges, self-study through grammar books, self-study through audiobooks… you name it. So I am always curious when a new opportunity arises to improve my language skills. And that’s why I jumped at the offer when Franglish invited me to join one of their speed-dating-meets-language-class sessions. Franglish hold language exchange events in various bars around Paris (also in Nice and in London) about 3 times per week. Sign up in advance on their website. The fee is only €12 (or €8 for students), which includes one drink. So it’s quite reasonable. The events are quite well organized, by their very friendly bilingual staff. Do not be turned off by the line to check in – it goes quickly and once you check in and get your drink ticket, there’s no more waiting around. Each of the 30+ participants is matched with a native (or at least fluent) speaker of the other language. As long as you can string together even a few words in the second language, you are welcome. You are seated at a table with papers and pens and a dictionary in case you get stuck. The organizers are also happy to answer questions that may come up. You speak for 7 minutes in one language, then switch to the other language for another 7 minutes. After the 14 minutes, the organizer will come by and tell one or both of you to move to another table. All the tables are clearly numbered so there is no confusion. You meet about 7 people in total by the end of the event. If you don’t like the person you have to talk with, it only lasts 14 minutes in total. But if you do like the person, feel free to chat during the quick break in the middle or after the 2-hour event, or exchange numbers to meet up another time. This is a serious language exchange event. But in case you were wondering, there does seem to be a wide range of ages and a near 50/50 balance of men and women. It’s a great way to meet locals (for English native speakers) or someone outside the usual circle (for the French) or maybe even… plus si affinités…. By the way, for the French speakers wanting to learn or keep up their Spanish, there is also a French/Spanish version of Franglish! So… How Was it in Practice? Overall, I’d say it’s a great idea. Not for everyone but certainly a great option for many. At first I was a bit annoyed that the room was quite noisy. But I realized that is actually a good thing – it provides a more realistic setting. It’s easy to understand people speaking French one on one with no background noise. The real challenge is when you are out in a social setting. It did get a bit tedious always chatting about why I was in Paris, what I do for work, etc. I suggested to Franglish that they might consider a little experiment at one of these events. What if they had a stack of cards with random subjects to pick from? Choose one and talk away! It could be annoying, but it would also force the participants to talk about a wider range of subjects and broaden their vocabulary. It could an least be one option. But of course, there is nothing stopping the participants themselves from arriving at the event with a list of possible discussion topics just to spice things up. One thing I noticed is that none of the people I spoke with ever corrected my French, even when I know I didn’t say something correctly. There is not much that the organizers can do about this, but perhaps it would be worthwhile for participants so choosing to to mention at the beginning if you would prefer to be corrected? So the final verdict? I would not bother with one of these events if your French is already quite good or if you have plenty of friends already to speak French with. But if you are looking for more opportunities to speak French, if you want to take French classes but they are too expensive, or especially if you are looking for a regular language exchange and want to try out some possible candidates, this is a great opportunity. I did meet a number of people at the event who attend on a regular basis. But I would say look at it like speed dating. You try out a number of potential language exchange partners. Maybe it takes 3 or 4 sessions. But eventually, hopefully, you find a partner you can stick with for a while.